Finally, some good news about the drought. Dry conditions have apparently curbed the spread of sudden oak death in 12 coastal California counties, reported Guy Kovner in the Santa Rosa Press Democrat. "If we had one more year of drought, it would really be ideal," said Matteo Garbelotto, UC Cooperative Extension specialist in the Department of Environmental Science, Policy and Management at UC Berkeley. Cleaning boots after a hiking trip helps prevent the spread of sudden oak death. Sudden oak death is creeping into Carmel Valley, and scientists have found infected trees in Gilroy and Prunedale, reported the Salinas Californian. Warm weather seems to be keeping SOD out of the Salinas Valley, but it is having a deadly effect on the surrounding forests. An image from the Oak Mapper website (oakmapper.org) where citizen-submitted scientific data is collected. A Sudden Oak Death "Blitz" planned for Sonoma County June 15-16 will prepare local residents to spot infected plants, collect samples from their neighborhoods and submit them for laboratory testing, reported the Kenwood Press. The session is hosted by UC Cooperative Extension Master Gardeners and Matteo Garbelotto, UCCE specialist in the Department of Environmental Science, Policy and Management at UC Berkeley. 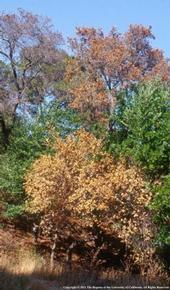 An dramatic increase in sudden oak death incidence it believed to be tied to recent weather patterns. Aerial and ground surveys have documented 375,700 new cases of dead live oak and tan oak trees over 54,400 acres of California where the pathogen that causes sudden oak death is known to exist, reported the San Francisco Chronicle. Last year there were 38,000 dead trees covering 8,000 acres. Diseased trees were even found in Golden Gate Park, where there is no obvious source of the pathogen, such as nurseries or wildland.